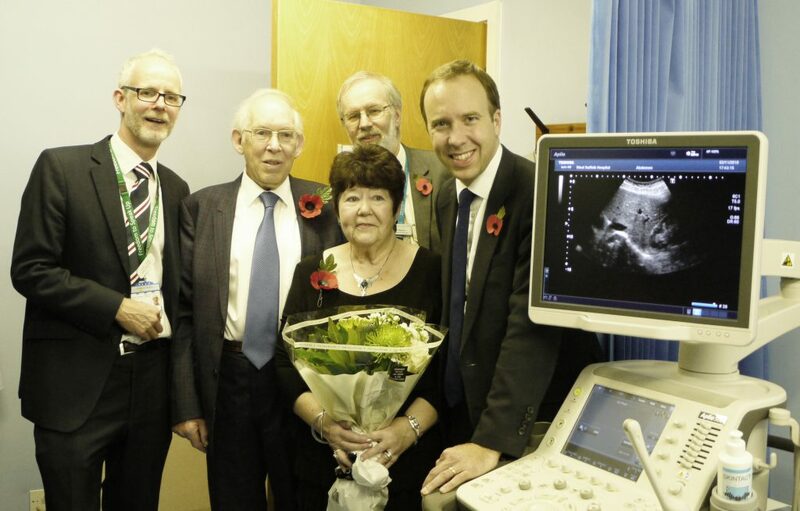 Local West Suffolk MP and Secretary of State for Health and Social Care, Matthew Hancock, joined fundraiser Mrs Betty McLatchy on Friday (2 November) to formally open a brand new ultrasound service that will see Haverhill patients receive ultrasounds in the town for the first time. The service, which will be manned by sonographers from the West Suffolk NHS Foundation Trust (WSFT) and has been supported by the NHS West Suffolk Clinical Commissioning Group (WSCCG), will start on 8 November at the Christmas Maltings surgery in Camps Road, and means that Haverhill patients will be able to have much-needed scans without leaving the town – no longer having to travel to West Suffolk Hospital, Addenbrooke’s, or Newmarket Hospital for the service. The new state-of-the-art ultrasound equipment will enable a number of procedures to be carried out closer to home, like abdominal scans, including liver, kidney and gallbladder scans, and pelvic scans like those for ovarian cysts. It has come to fruition thanks to the unwavering efforts of Betty McLatchy, former Haverhill councillor and mayor, who spearheaded a whopping £20,000 of community fundraising to contribute towards the equipment required. Betty said: “I’m absolutely delighted to see this service launch. Betty, who lived in Haverhill for 10 years before moving to Wales with her husband Ivor in 2017, spent three years fundraising across the town for the ultrasound machine after injuring her thumb in an accident and finding that there was a lack of local health services she could access in the town. Market stalls, dinner dances and some generous grants from borough council locality budgets all helped her to reach the staggering £20,000 donation. And Betty’s hard work has now helped to purchase a £65,000, high-end ultrasound machine, which has been affectionately nicknamed ‘Lewis’ by the WSFT staff that will be using it – all the Trust machines are named after famous detectives. “It’s fantastic that by working together we’ve been able to launch this new service for Haverhill. The community, led by Betty, has worked with us to provide the equipment, the Christmas Maltings Surgery team has provided the room, the West Suffolk CCG has helped to convert it into an ultrasound-friendly clinic space, and we have provided the staff to run it. Those at Friday’s event were welcomed by WSFT chief executive Dr Stephen Dunn and WSCCG chief executive Ed Garrett, before being invited to see the new ultrasound equipment by sonographer Jayne Marling and equipment engineer Bob Brough. Paying tribute to Betty’s fundraising, the Secretary of State said: “The most important thing is that the people of Haverhill, a growing town, are no longer going to have to travel to Bury for their ultrasound. “We have not had secondary care in Haverhill – we have primary care, but now we’ve got the hospital providing services directly in town for the first time. So I regard this as a small beachhead for West Suffolk Hospital, which has always been regarded as the Bury hospital, but now is spreading out across the west of Suffolk. Dr Ed Garratt, chief officer for WSCCG, said: “It is pleasing that the ultrasound machine will soon be ready to be used by West Suffolk Hospital’s team, helping support the health and wellbeing of people in Haverhill.